Cynric Endell is a Breton thief and a member of the Thieves Guild in Riften. Before joining the guild he worked as a jailbreaker but quit after a botched job landed him in a High Rock prison for three long years. He now spends most of his time training his archery skills. After waking up at 8am, Cynric will wander around the Cistern for two hours and then head over to the dining table for a two hour breakfast. Once he's finished, he'll relax for another two hours and then spend the rest of his day training his marksmanship on the Cistern practice target, with a four-hour break between 6pm and 10pm. At 2am he calls it a day and heads back to his bed, which is just to the left when entering the Cistern from the secret entrance. He wears the standard Thieves Guild armor, gauntlets, boots and hood. 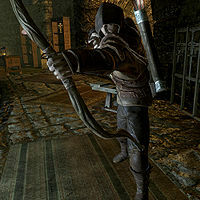 He is equipped with a steel dagger and a hunting bow supplemented with 12 steel arrows. He also carries two lockpicks and up to 18 septims. "I think you're all right. In fact, I'm kind of impressed how well you're doing around here. Just keep it between us, okay?" "I've seen a lot of thieves come and go, but I've never seen anyone as good as me." "I could crack the lock on any house blindfolded before you even got your picks out of your pocket." "Been in the Guild a long time... joined right after Brynjolf. Not interested in leadership though, that's more his kind of thing." "I don't care if Vex was chosen as a Guild Third over me, she deserved it." "I kind of like watching things from where I am. Making money is all I care about." Apparently, his lockpicking skills are well known in the guild, even if his actual skill level is a measly 15. When you talk to him, it is therefore natural you'd inquire about them, to which he'll answer: "Pull up a chair, my friend... this is quite a tale. When I started out in this business, I wasn't really interested in the Guild or being a thief." He'll then elaborate: "I didn't mean to imply I was earning an honest living either. With my lock picking aptitude, I was a natural at jailbreaking... made a great deal of gold doing it too." If you ask him to elucidate he'll say: "It's where a client pays you to get arrested, and you get thrown into a prison for the express purpose of breaking out. Usually it's to free someone the client cares about... and sometimes to... well, to kill someone on their behalf. Either way, the trick was in the escape, and that's where my strengths came in handy." When you ask him why he quit, he'll reveal his motives for joining the guild: "Well, as a jailbreaker, you work alone. No Guild to back you up. I'd do jobs for the Thieves Guild and the Dark Brotherhood, but if things didn't go as planned, I was on my own. The last jailbreak I attempted failed. I was imprisoned in High Rock for three years before they let me go. After that I promised myself I'd never do it again." He'll also confess to taking the easier path and not entering the Dark Brotherhood: "I don't know. I think I realized that out in the world, my skills would bring me more wealth as a thief rather than an assassin. Killing someone in a jail is much easier than what the Dark Brotherhood deals with. I guess I wanted to play it safe. I already knew Delvin, I asked if I could join up, and that was that." Before you convince the guild of Karliah's innocence, he'll refuse to speak with you: "So it's true. You've turned traitor. I can't believe it." After though, he'll be stunned: "I never saw this coming, I thought we were just having a run of bad luck." Once you become Guild Master, he'll offer his support: "As long as you continue to make us all rich, I'm behind you." If you've been suspended from the guild, Cynric will refuse to talk to you at length, stating "Hmph. I don't talk with Guild traitors." Cynric: "So, Thrynn, you were a bandit, huh?" Thrynn: "Yeah, what of it?" Cynric: "So is it true, bandits get... you know, real friendly with the wildlife?" Niruin: "All right. I have everything you asked for all ready to go." Cynric: "I hope this deal goes through. I'm putting quite a bit of coin on the line... and the last two you set up fell through." Niruin: "I don't understand it either. They were a sure thing, I swear." Cynric: "You just better hope this one isn't another waste of my coin." This page was last modified on 23 July 2013, at 21:31.